Make sure the yurt is available in the winter months (November – April). 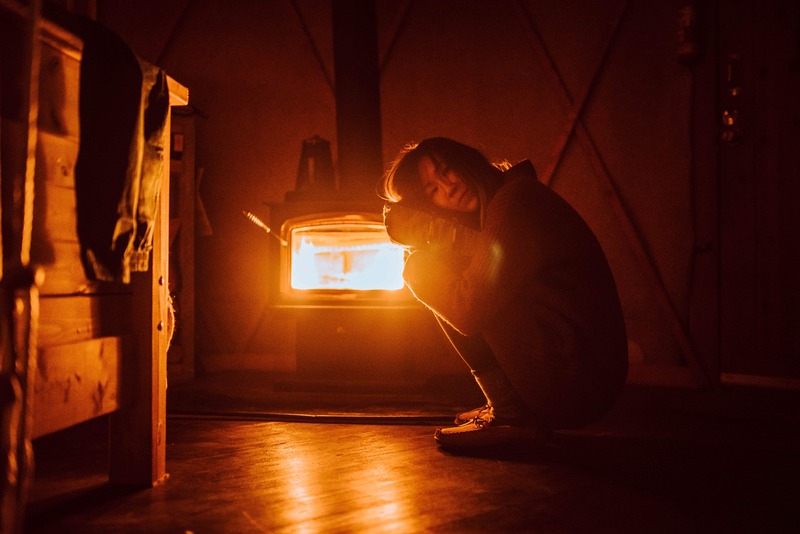 Majority of yurts are heated with a wood stove. Research what shower and washroom situation you have and pack accordingly. Know how much to pack by reading your yurt’s description box and looking at pictures. Make your meals before your trip and pack it. Bring flashlights and sources of light if you’re staying up at night. 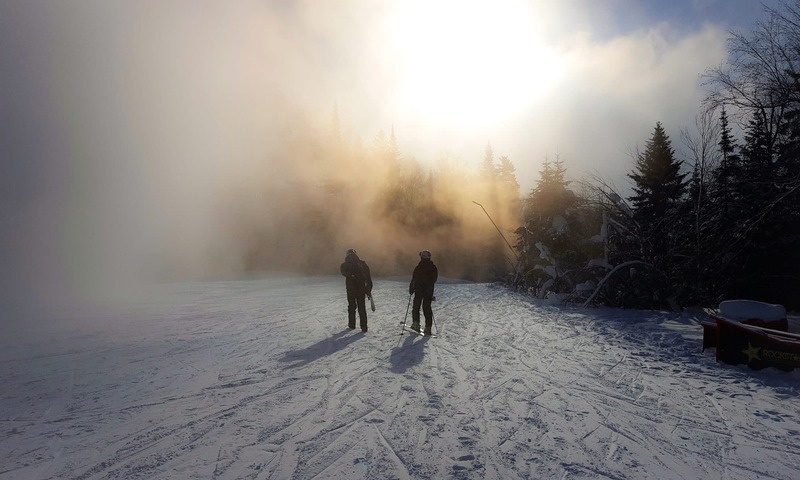 Not ready to unplug from the world? There are a limited number of yurt locations that offer electrical outlets or WiFi options. Angelo and I booked our first winter yurt camping experience this year and we had an incredible time. For the first time in ages, we spent a couple of nights completely unplugged from the rest of society. It. Was. Amazing. But, it wasn’t entirely without hiccups! I thought it would be smooth sailing with our combined experiences of summer camping and my one-time week-long dog-sledding experience. Turned out, we started our winter yurt camping experience with a lot of unanswered questions and learned quite a few lessons during our stay. For example, we learned that when the host told us to stoke our wood stove often, they meant it. On our first night, we went to bed thinking we’d only need to re-stoke the stove every three to fours. We set an alarm to wake ourselves up at the three hour mark. Ahh the optimism of first-timer wood stove users. Three hours later, lo and behold, our fire was out. To make matters worse, most of our embers had cooled completely too! Neither of us wanted to get out of bed and try to restart the stove in the darkness (the host set it up for us when we arrived, so we had to start it all from scratch at this point). We ended up huddled under the sheets waiting for enough morning light to restart it! Let’s start off with the basics. A yurt is a portable, large and circular tent traditionally used by nomadic groups as their primary form of shelter. Nowadays, modern yurts also act as spaces that provide temporary housing, guest lodging, meditating, and vacationing. A yurt has more room than a traditional tent. It generally comes with basic amenities to set you up for a more comfortable stay. Most yurts come with mattresses, a desk, and some chairs. As a vacation or camping accommodation, yurts are aimed to help campers reduce the amount of bulky gear you need to bring for your stay. For us, a yurt was like an over-sized tent. They are similar to what a rustic cabin might offer, but… with slightly less comfortable amenities. We had everything we needed inside the yurt, with the exception of running water. So it definitely wasn’t a drab stay. Even without running water, we had a private insulated outhouse less than 20 meters away. There was even a chamber pot inside the yurt for us to use when the winter cold was too hard to step outside! Winter yurt camping is definitely a step up from my last winter camping experience of sleeping under three sleeping bags. When we were researching a yurt nearby Toronto, we actually found out that not every yurt location is available year-round. In an upcoming post, you will find a list of yurts near Toronto that are available in the winter months (November – April). Check the description, or call to make sure that the location you’re interested in offers bookings in the winter months. 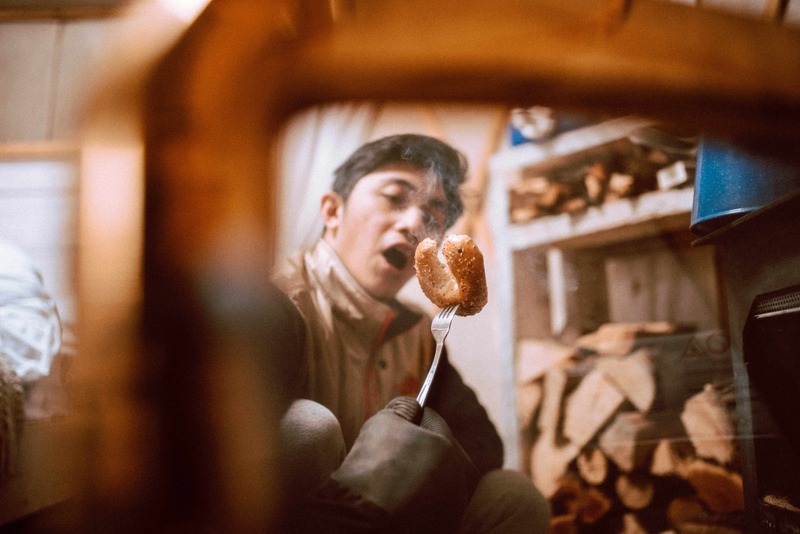 Angelo using the wood stove fire to toast our morning bagels – check your bagel frequently as it toasts quickly! Most yurts available in the winter months use wood stoves for heat. Very few, may offer electrical heating. This means that in order to stay warm, you must stoke a fire every couple of hours or less. This might not be for everyone. Remember our earlier story about how the fire went out because we thought re-stoking every three to four hours was sufficient? We took our first night as a lesson, and on our second night, Angelo woke up dutifully every 1.5 hours to check on our fire, re-stoking as needed. If you’re on stoking duty, expect short, periodic sleep. Even if the yurt provides electrical heating, err on the safe side – pack your warmest gear – especially for nights that may drop below -10 degrees Celsius. Most electrical heaters are small and function like space heaters. Even running a small electrical space heater 24/7 would still be insufficient to warm the entire tent on the coldest days. Ah… addressing the needs when nature calls. Through my research for winter yurt camping locations, I’ve come across a variety of washroom and shower options. It ranges from nothing at all, to full indoor running water options. Regardless of the type of situation you pick, bring your own hand sanitizer and toilet paper in case your place runs out. If you’re staying for more than a couple of nights or really need to shower, check with the hosts or the provincial park for shower options and if they provide towels. They might also let you know about any restrictions to the type of soap you should use. Many yurt owners support ecologically-friendly practices and prefer or restrict soap usage to biodegradable soap types. Respecting the host’s request is important to ensure that everyone can have a chance to experience a pleasant yurt camping experience in the future. One additional thought is to remember to pack your shower sandals or flip flops (plantar wart alert!!) if you’re going to shower. These things almost never come to mind during winter excursions, but for your feet’s sake, please pack them. 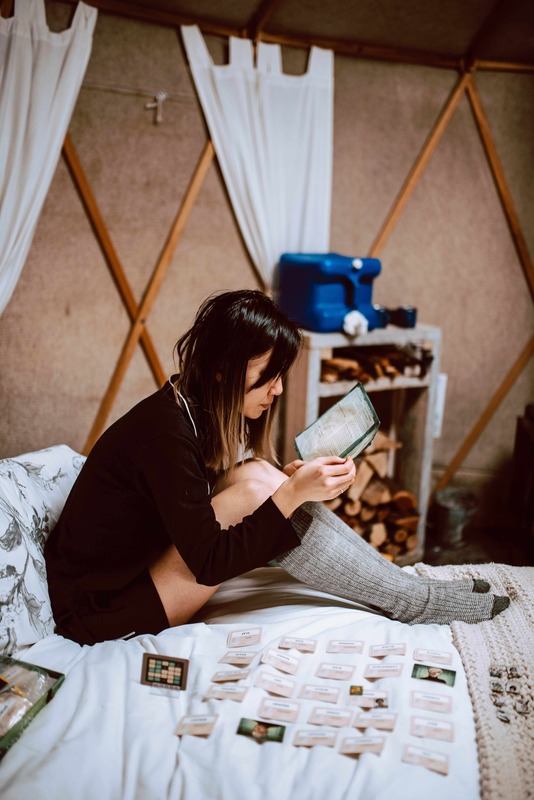 Spend some time reading the description boxes of your yurt accommodation and look at people’s pictures to figure out what ‘furnished’ really means. Provincial park yurts strongly encourages you to bring sleeping bags as extra linens are not provided. Personally, I’d bring a couple of sleeping bags just in case one isn’t enough. Other yurts, like the ones offered by Glamping Hub or AirBnB, have additional host-provided amenities. You might expect additional items like cookware, dishes, dish soap, and a Queen bed. Here you can see that our winter yurt camping was on the more luxurious side. Our yurt offered us a lot of extra amenities – from the hooks on the door, the dresser behind Maria, and the variety of cups, plates, coffee, and tea in the dining area. Warm slippers – if you don’t have a pair of indoor shoes, bring some – the floors get really cold! Some host yurts even offer electricity too! There were a couple in Ontario that offered WiFi, electrical outlets, mini fridges and running hot water. You really need to read the descriptions and look at the pictures to know what to expect. Be sure to read the user reviews as well to see if you can glean any additional information. Most yurts offer an outdoor BBQ nearby for your cooking needs, but these are often in unsheltered locations. That means you’ll likely be exposed to the elements while starting your BBQ and waiting for your food to cook. If you’re planning on doing a winter yurt camping trip when it will be lower than -10 degrees Celsius, chances are you probably don’t want to be standing outside for more than a few minutes. While we didn’t use our BBQ during our yurt stay, our host told us that on especially cold and windy days, its a challenge to start the BBQ. Hence why we recommend pre-cooking your meals and packing them in with you. Alternatively, map out restaurants nearby if you want to avoid cooking altogether. Winter yurt camping offers a unique opportunity to stargaze because of the long nights. Unfortunately, because of the early nights, it also means less light to see what you’re doing too. Most yurts do not have any light beyond the lights emitted from your wood stove. 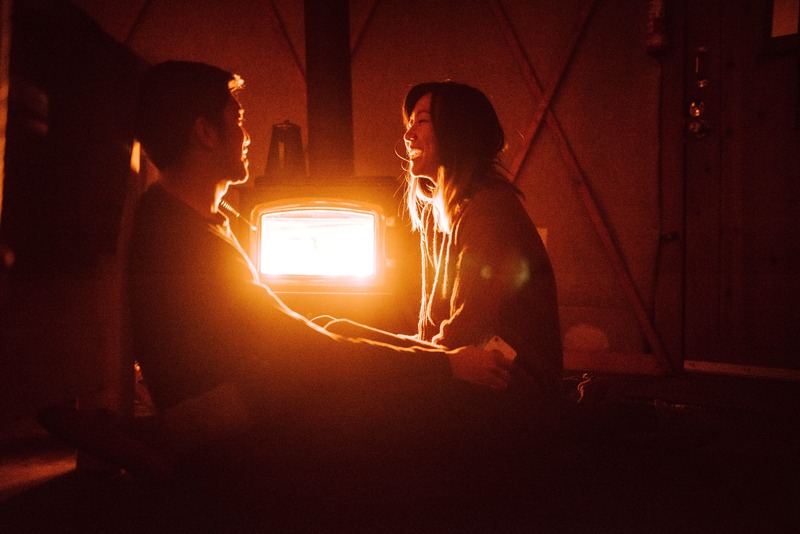 While it does emit romantic lighting, you won’t get enough light to fill the yurt. During our stay, our hosts provided us with two additional battery-powered lanterns. Even with the lanterns, we only had about an additional 1-meter perimeter of visibility inside the tent. 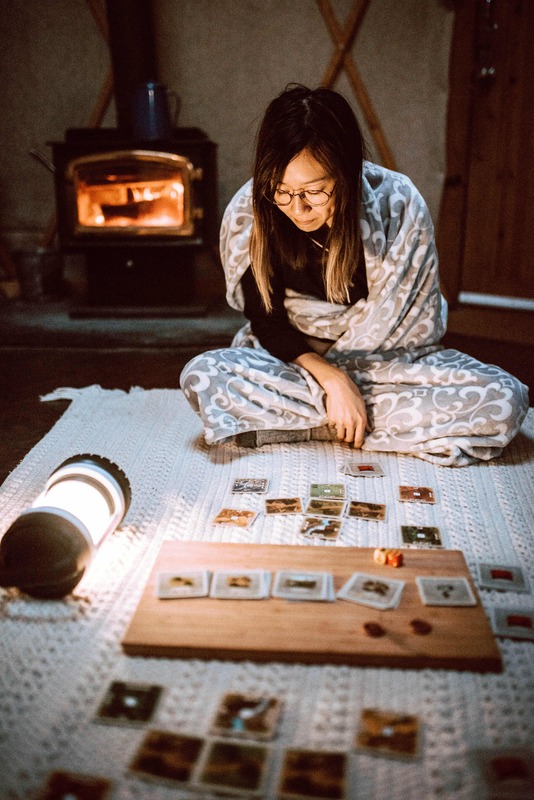 Maria’s using the lantern to read board game manual. Without it, its unlikely we would have been able to play a round of two-player catan! Furthermore, depending on your washroom location, bringing a handheld light will be great for when you need to go outdoors when nature calls. The appeal of winter yurt camping or other glamping options is that it gives your group a chance to reconnect with the physical world. But, in the case that you really can’t unplug, or really need to charge something, then your next winter yurt location might be severely limited. Alternatively, you can bring your own gear to supplement your experience, like packing a car charger, solar electrical outlets, or getting an additional data roaming plan. That’s it – hopefully these tips stemming from some of the lessons that we learned, will help make your first winter yurt camping experience more pleasant! If you’ve got any additional tips you’d like to share, let us know in the comments below, or feel free to send us an email! We’d love to year what your first winter yurt camping experience was like!